Twice a finalist, Felix has experienced the highs and lows of WSM, from his fourth place finish in Sanya, to his torn biceps in the 2008 event. Renowned for his deadlifting ability and grip strength, Felix has a 400kg deadlift in a powerlifting competition and is a world champion and record holder in the ‘Rolling Thunder’ grip event. This year he will be hoping to maximise those attributes and make the final after an absence of four years. How many hours per day do you train? What does your training involve? Circuits, gym, specific event training and olympic weight training. What does your diet normally consist of? Breakfast: 6 weetabix, skimmed milk. Snacks: fruit, nuts and protein shakes in between. 7000 a day. What made you want to become a strongman? By accident, in 2002 I made up in a competition for a friend, having never touched eqt before. Won 2 of the events and came 3rd – I was hooked. 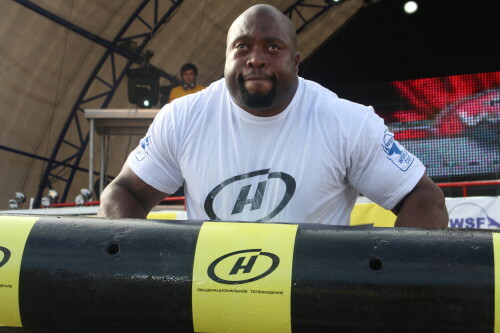 How old were you when you started training and competing in strongman? I was 26 when I started weight training and 37 when I started strongman training. What is your greatest strongman achievement? Some would say 4th in sanya in 06. I say every time I win an event. How do you manage to balance work and training for strongman? Support from my wife and family, it’s very difficult but it’s worth it. What is the worst injury you have ever had? Easy, right Bicep tear WSM 08. What are your plans after your strongman career? In the past I have said that’s a long way off. Because of the injury last year and 4 months off work I have had to look at other options now. This has included modelling and TV work, so who knows. What has been your biggest disappointment whilst training as a strongman? Stereotype: people presume if you are strong and muscular you have to be taking something illegal. That’s a big disappointment. What advice would you give to someone who wants to become a strongman? Don’t rush it, take your time, learn how to lift correctly and you must have the passion and patience. 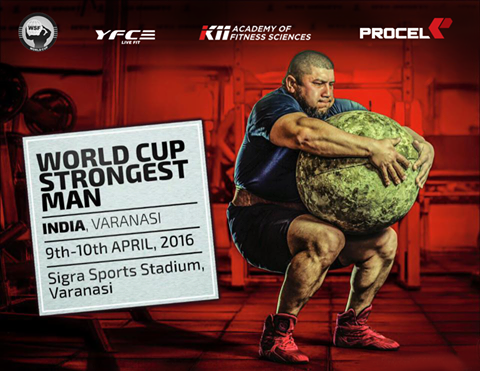 What is your favourite strongman event and why? Any grip event, deadlift, farmers, hercules. I have a good grip so I have less to worry about on these events. What is you least favourite strongman event and why? I don’t have a least favourite, but my overhead is never a dead cert. Which past strongman do you admire now & why? I admire them all, no one athlete stands out more for any particular reason. Which current strongman do you admire now & why? Mariusz, because he just keeps going like a machine no matter what. How do you prepare yourself for major events? Up my calories and my sleep, do more cardio and event training, earphones and ipod in later stages. What is your favourite other sporting event? Cricket, cricket and more cricket. Got to love the barmy army. What do you do to relax? Do you have any hobbies? Having a wife and 3 sons on top of strongman and work doesn’t give me time to relax or time for hobbies. Given your size, what’s the funniest thing that’s ever happened to you? I have had to go for a few MRI scans post surgery. I think the MRI nurse (thank goodness) had fun trying to get me into two gowns, one on my front, one on my back – in the end I had to walk down the hallway as they wouldn’t even go up my arms, never mind my chest. Do you have any nicknames? If so, what’s the story behind your nickname. Felix. I was born Mark Trevor Felix. The priest would give you your first name, parents would choose the middle name. Growing up I was trevor, working on ships with many people from the caribbean given biblical names, its customary to go by the surname. Since ’88 I have been Felix. What would be your favourite type of holiday and destination? Probably Disney, really we are in need of a family holiday that isn’t about me. I can’t think of one – I love Action, Western & Chinese movies. What car do you drive now and what car would you like to drive? Now: Kia (Karens) – Future: Any Bentley. What personal achievement are you most proud of? Achieving being a father to my 3 sons. Maybe being the first person to break the 300lb barrier on the Rolling Thunder deadlift. Who is your biggest threat for 2009 and why? Terry always being a fellow brit. 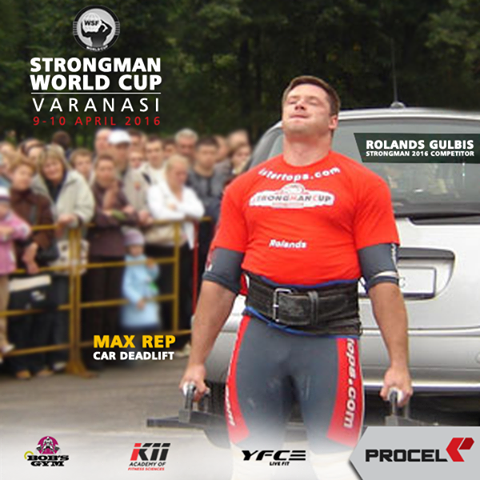 I am always chasing Mariusz and I have something to prove with Derek because of WSM 08. If you could saint a sports person who would it be? Lance Armstrong is top of my list.